The case manager's early identification, stratification and care coordination of high-risk patients reduces hospitalizations and emergency room visits of the elderly and chronically ill, improves medication adherence and closes care gaps that trigger or exacerbate health conditions. Today's healthcare case manager has moved beyond the health plan office, working alongside the primary care physician, the hospital discharge planner and the nursing home staff in a substantial care management role. Teresa Treiger: The Role of Case Managers in Emerging Care Delivery Models. Click here to listen. Robert Fortini: Embedded Case Management in the Primary Care Practice: Program Design and Results. Click here to listen. Dr. Joseph Agostini: Advanced Illness Care Coordination: A Case Study on Aetna's Compassionate Care Program. Click here to listen. Irene Zolotorofe: Recruiting, Training and Case Load Management Strategies for Embedded Case Managers. Click here to listen. Karen Black: Leveraging Case Management Tools and Technology to Improve Outcomes. Click here to listen. Jay Hale: Telephonic Case Management: Protocols for Behavioral Healthcare Patients. Click here to listen. Lisa Sasko and Charlene Schlude: The Role of Embedded Case Managers in Clinical Transformation. Click here to listen. Dr. Randall Krakauer: Demonstrating the Value of the Embedded Case Manager for the Medicare Population. Click here to listen. Melanie Matthews: 2011 metrics in healthcare case management. Click here to listen. Jan Van der Mei: Co-locating case managers in the care continuum. Click here to listen. Rebecca Ramsay: Identifying, monitoring and managing target populations for case management. Click here to listen. Toni Cesta: Embedding a case manager in the emergency department. Click here to listen. Dr. Sam Toney: Applying integrated case management to Medicaid's high-cost, high-need members. Click here to listen. Diane Littlewood: The benefits of co-located case managers. Click here to listen. Mary Cooley: Priority Health's four-point strategy uses case managers to help reduce readmissions. Click here to listen. Aetna: The key role of case managers and advanced practice nurses in Aetna's Transitional Care pilot. Click here to listen. Geisinger Health Plan: Case managers backbone of GHP's efforts to improve care delivery. Click here to listen. Question: Can You Describe a Typical Telephonic Case Management Session? This week's expert is Jay Hale, LPC, CEAP, director of quality improvement and clinical operations at Carolina Behavioral Health Alliance (CBHA). Response:(Jay Hale) Average length of a session is about 15-20 minutes. It usually starts with a greeting period that dovetails into a conversation about symptoms/improvement. We then broaden the conversation to ask about external support and ability to handle day-to-day activities. We ask some specific questions related to their particular area (i.e. going to meetings, medication adherence, following family rules, etc). There will then be a closing and planning for the next case management meeting (set up specific time). Any concerning response would trigger further exploration (i.e. worsening symptoms, not going to meetings, etc). For more information on case managers, please visit: Telephonic Case Management Protocols to Engage Vulnerable Populations. Free E-Book: Profiles in Case Management — In-Depth Interviews Outlining Skills, Background and Trends . 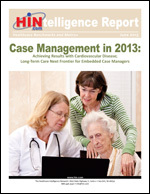 Sign up today to receive an issue of Case Management Monitor, a free bi-weekly e-newsletter that launched June 7, 2011. Follow us on Twitter between issues! Case Management in Value-Based Healthcare: Trends, Team-Building and Technology delivers advice for the profession on surviving and thriving in the post-reform healthcare landscape from the president of Ascent Care Management and a familiar voice on the case management scene. New Horizons in Healthcare Case Management: Benchmarks, Metrics and Models examines the latest trends in healthcare case management, the impact of case managers across the care continuum and what's working in embedded or colocated case management, an emerging strategy of positioning case managers inside primary care practices. Telephonic Case Management Protocols to Engage Vulnerable Populations describes a suite of tools to facilitate identification, interaction, surveys, follow-up action, resource matching, and member engagement and outreach for a behavioral health population that is also a template for case management and care coordination of any organization's hard-to-reach or vulnerable members.